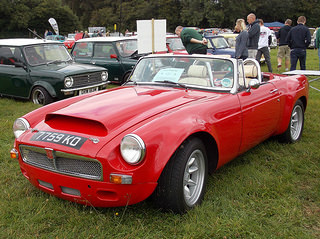 Although the MGA was the best selling MG sports car to date, by the time it was retired in mid 1962, it had reached its sell by date well before. Furthermore, the development of its successor had been continually delayed. 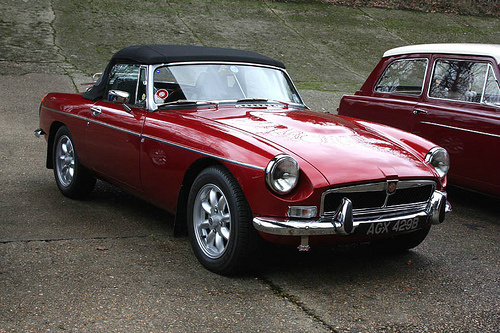 However, in September 1962, the Mark 1 version of the MGB sports car was finally launched. It had been conceived, as far back as 1957, as a fixed head coupe, which would eventually become a roadster, and be destined to be the replacement for the MGA 1600. The original concept, by the Italian designer Frua, was based on an MGA chassis with eye catching body styling. However, this was rejected in favour of what would become the classic MGB shape. A 2 litre, V4 engine was originally put forward but, due to high development costs, the chosen unit was the same one powering the MG ZA Magnette since 1953 and the MGA 1600 since 1959. From the beginning, it was anticipated that the car would have a projected manufacturing life of only seven years. It was to be a brand new car in terms of styling, with a unitary body and chassis structure which allowed the passenger compartment to be increased, giving additional leg room and luggage space, whilst the overall length was still less than that of the MGA. The final shape of the MGB was created after much development work, which had taken at least four years. The smooth aerodynamic styling of the 1957 prototype was wind tunnel tested to study the effects of headlights, grills and the passenger compartment. Instead of the sloping grille of the MGA, a vertical slat version was incorporated so that larger engines could be added, if required, at a later date. The initial choice of engines was between the 1622 cc, B-Series, overhead valve unit as used in the MGA 1600 Mark 2, or the 1588 cc unit featured in the MGA Twin Cam sports car. As a result of all the problems experienced with the Twin Cam engine, it was decided to stay with the tried and tested B-Series unit. Since the MGB was slightly heavier than the MGA, then it was agreed that the power of the B-Series engine should be increased to ensure that there was no reduction in performance of the new sports car. Accordingly, the engine was then bored out from 1622 to 1798 cc, which produced 95 bhp at 5400 rpm, and 110 lb/ft of torque at 3000 rpm. A compression ratio of 8.8:1 was obtained when different pistons were used that had concave heads, as well as larger main bearings. However, there was no change to the cylinder head, valves, valve gear, manifold, three bearing crankshaft, or the two SU carburettors. Since the resultant engine ran hotter than previously, an oil cooler was added to export models, and was offered as an optional extra on UK versions. A 1962-67 MGB Mk1, in average condition for the year, would fetch anywhere between £5,000/$8,000 to £7,000/$11,000.